Who doesn't dream of an ideal getaway with good music, BBQ, bonfire, great company and excellent food and drinks? Aryavart Farms in Panshet should be the destination you should visit when dreaming of all the above. At just 40 km from Pune, you can enjoy the panoramic view of the Panshet Backwaters with friends and family during your weekend getaway. Your lakeside stay will include barbecue, bonfire, music and DJ, drum circles, games, and much more. There are two options for accommodations- a villa or a safari tent. For INR 1200 per person, you can stay in a villa. 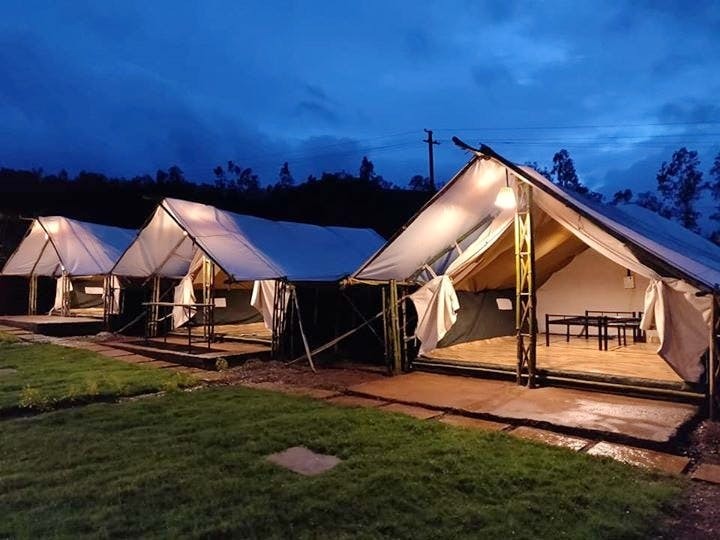 The tariff for staying in a tent per person is INR 1000 only. They also organise corporate events and seminars and have separate packages for the same starting at INR 600 per person. If you are looking for a picturesque location for pre-wedding shoots, the view will add an element of magic in your pictures. We love the fact that the prices are inclusive of meals. Not just that, they offer discounts for weekdays as well. For a fun stay where you are looking forward to making a lot of memories with your near and dear ones, this lakeside camping destination is the one for you. Avoid visiting during monsoon as there are chances of the lake getting overflown.